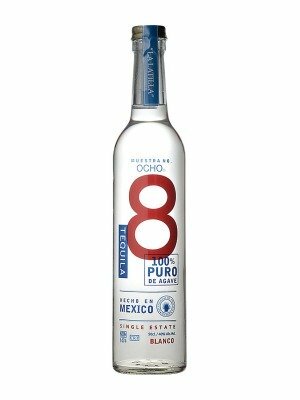 Ocho Blanco is a popular Tequlia available from DrinkSupermarket.com in 50cl to buy online. Visit DrinkSupermarket.com for the best price for 50cl of Ocho Blanco or compare prices on our other Tequlia products. Colour: Clear and bright. Nose: Cedar, cut green grass or alfalfa, mint and spice, brine - like acidity, subtle, fruit, custard, honeysuckle. Palate: Earthiness and minerality, dry , soft attack, pepper and mint go to round plums at mid- palate moving on to sweetness , finishing dry, and austere long lingering with hints of raspberry. Rancho 'El Carrizal' was nicknamed 'La Langacha' by Don Felipe Camarena because it is a long thin strip of land which he joked could be jumped over. 1978 m, warm days and cool nights creates agaves with a balance of sugar and acidity as in grapes used for wine production. N.B. The above sentence explains the character of all Tequila OCHO expressions. Because of the combination of sugar (fruit and sweetness) and acidity (structure), the tequila holds its flavour elements in balance. Paul McCartney was the sweetness and John Lennon was the acidity in their songs. Between them they made 'balanced' music that has lived through the generations. Where to buy Ocho Blanco ? Ocho Blanco Supermarkets & Stockists. You can buy Ocho Blanco online in most retailers and find it in the Tequlia aisle in supermarkets but we found the best deals online for Ocho Blanco in DrinkSupermarket.com, Amazon.co.uk, TheDrinkShop, and others. Compare the current price of Ocho Blanco in 50cl size in the table of offers below. Simply click on the button to order Ocho Blanco online now.